SU Students open the opera "The Gondoliers" with a bang in their performance in Setnor Auditorium. Review: SU Opera Theatre's production suffers from maturation and casting issues. Decades of practice and patience lead to greatness--at least for some of the world’s most renowned opera singers, who often wait until their 30s, 40s or even 50s, before their voices mature to a perfect timbre. Going into The Gondoliers, I kept this in mind. 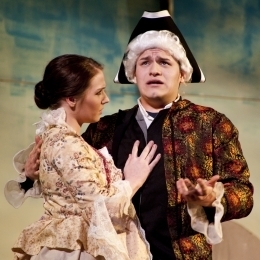 Gilbert and Sullivan's The Gondoliers, an operetta performed by the Syracuse University Opera Theatre, ran from Jan. 27-29 in Setnor Auditorium of Crouse College. In the story, two gondoliers, Marco and Giuseppe, marry they women they love, Gianetta and Tessa, only to discover minutes later that one of them is the King of the Island of Barataria and is already married to Casilda. But Casilda (Carina DiGianfilippo) is in love with her father's servant, Luiz (Matthew Hernandez). 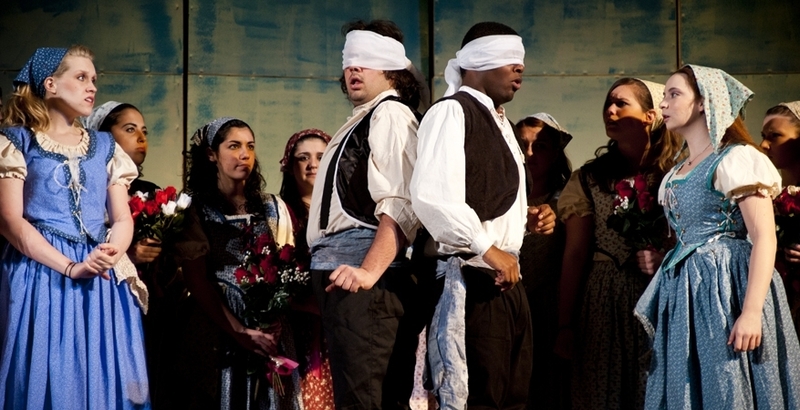 Characters Casilda and Luiz sing of their love in the performance of "The Gondoliers." These singers, mostly SU undergraduate students in their early 20s, still had many years before their voices reached a professional level. That being said, I was pleasantly surprised to hear the voices of DiGianfilippo and Rachel Boucher (Gianetta) voices. DiGianfilippo possesses some star quality, illuminated by her radiant face and vibrant voice. Unfortunately, she has not reached a level of comfort in her acting yet -- except for the few moments she was lost in song. Other performers also appeared uncomfortable -- Tevin Habeebullah’s Giuseppe consistently directed his lines toward one spot on the ceiling. Some fared better than others, though. Evan Wichman delivered my favorite performance of the show, playing Duke of Plaza-Toro. He seemed most at ease onstage, and his voice was pleasant, though he needs more time for it to deepen and mature. Some of the stiff portrayals made me question the casting of the performance. While Dominique Forbes' Tessa evoked a few chuckles from the audience, she overdramatized her actions. At the same time, her voice was not strong enough to project through the auditorium. Although I was sitting in the third row with nobody in front of me, I couldn't hear her the entire time. Had the orchestra not come in at all, the song may have been better. The orchestra repeatedly featured mini-solos of players entering too early and became offbeat far too often for musicians still in college. The flautist especially bothered me, because she was placed on the end of the row. Without strong singers or any buffering, her high notes were piercing. Moving her into one row farther would have helped. Overall, the performance seemed premature. Even for a low-budget production, the backdrop appeared hastily prepared--a slash of paint roller marks of blue on white depicted the sky. When I sat down and saw the backdrop, I knew the performance would either be avant-garde or substandard. Unfortunately, it was the latter. Perhaps after a few years of maturation, this show will realize its full potential. Submitted by Disappointed reader (not verified) on February 1, 2012 - 3:29am. I am very disappointed in the way you have chosen to write about these students and their production. The most shameful thing about this article is that not only do you make yourself sound ignorant as a writer, you display ignorance towards music and talent. It is obvious that these students have reached maturity in their voice, (after all that is how you started your article), so why then bash them for something they have no control over? It is very unprofessional and it is a representation of you as a person, and sadly Newshouse as a whole. I understand that not every writer is as disrespectful, however when you publish such ignorance it speaks of the entire staff. Any intelligent audience member would know that one does not sit in the thrid row when the orchestra is at level- I would have thought that was common sense. And to say that the Flute should have been placed else where is extrememly ignorant, seeing that the flute has been seated there for as long at Orchestral music has been written for them. To say that the set was "cheap" is an extreme insult and if you have a audacity to talk about budgit realize before that it is the school of MUSIC not New House. They aren't as fortunate! This production was put on by a class, not an opera department. This was a learning process and the students learned alot about stage craft, and if you were intelligent enough you would have realized that as well. Another sad part is that you have the audacity to speak poorly of professional musicians like the professors you spoke ill of. That is beyond disrespectful! To say that Eric Johnson is not operatic enough is the biggest joke I've yet to hear. If you truely did your "research: as you say you did, you would have know that he had a 10 year career across Europe performing . How dare you insult him?! And James Welsch is one of the best Conductors I have ever seen, he did not forget a section as I was there, I know this. Considering the fact that I know the score more than you can ever undertand I am fully aware that he never missed any part. I only hope that you have enough respect to appologize to the Setnor school of music for disresppecting their Students and Faculty. I think the entire staff should write an appology at that! I am disappointed in Newhouse for allowing such trash to be written and published. Submitted by Alexa (not verified) on January 31, 2012 - 8:09pm. This article is so unecessarily harsh to your fellow students, who worked extremely hard in the time that they had to put together this opera. Keep the criticism to yourself next time. Submitted by Emma (not verified) on January 31, 2012 - 12:48am. I am sorry you felt the need to compare this production on the same standards you would hold professionals. I am sorry that the Setnor School of Music only resides in a single building with limited means and does not contain an elaborate opera hall. I am sorry that you sat in the front row, a mistake many first-time audience members make in the Setnor Auditorium. I am sorry that we, as performers, are not "mature" enough for your taste. As for insulting every student and every faculty member involved in this production, I think it is you that needs to apologize. You took something that every person involved should have been proud to present to their school and community and threw it in the gutter, then stomped on it repeatly. This article greatly offends me and just about every student and professor in Setnor. Perhaps in a few years you can try again to review a student production, after you have had time to mature, of course. Until then, please stop writing opinion articles, since you do so in an intentionally cruel manner. Can I see your credentials please? Submitted by Alex (not verified) on January 30, 2012 - 10:30pm. As you can tell by all of the previous comments, anyone who knows anything about music or opera can tell you that this show was a really great student performance. I'm just curious, how long have you been studying opera? What credentials do you have to say these things about music students who have been working their tails off to get this show to where it is. It makes me incredibly angry that you felt the need to belittle your fellow students who work harder than you've ever had to work in your life. This can't even be considered a review, it's a bash, an absolutely ridiculous bash that wasn't even written well. It's completely obvious that you don't know what you're talking about when you say that Eric Johnson's voice is "not operatic," the man studied opera in Germany for 15 years for goodness sake! It's one thing to say things about students, but you have absolutely no right to say things about him. I hope you read all these comments and feel bad about all the terrible things you said. I would also suggest you write an apology to the cast and the orchestra for the horrible way you wrote this article. Again, you have no right. Submitted by Anonymous (not verified) on January 30, 2012 - 10:17pm. The review makes me ashamed to be a Newhouse student. But the fault does not lie solely with Ms. Desantis. From her NewsHouse profile page, I see this is her only article, so maybe she was assigned to the opera as an easy first piece. That, however, is not an excuse to publish the review without having proof-read it. From the point of view of a rational person, this article is overly harsh, inaccurate, and demeaning toward esteemed Syracuse professors. From the point of view of a student who has taken NEW 205, this article has confusing syntax, repetition, problems with verb agreement, and a serious lack of background research. I am also a student in the Setnor School of Music, so I believe I have the ability to hear mismatched tempos and early entrances. I heard neither. A quick Google search of “Gilbert and Sullivan” would tell any researcher that their operas are comedic and sometimes include interaction between the orchestra and the cast, so anything Ms. Desantis deemed a mistake was most likely part of the performance. The next time you cover a performance at Setnor, please assign a reporter who is knowledgeable on the topic and not simply concerned with perfecting her stereotypically judgmental Newhouse writing voice. Is this supposed to be a review..? Submitted by Liz (not verified) on January 30, 2012 - 7:29pm. Because all I'm hearing is a college student bitching as a poor attempt to cover up the fact that she knows little about her subject and didn't even bother to educate herself on it before she attended the performance. Newshouse deserves more professional representation than this. Shameful. I ended up seeing the opera. Not only did the performance exceed my expectations, the pit and the actors were a wonderful representation of the talent that VPA produces. I walked away happy that I went and with a new appreciation for our school's perfoming artists. Submitted by George (not verified) on January 30, 2012 - 1:37pm. What an ignorant review. Not surprising, coming from a layperson. Submitted by A Setnor School of Music Student (not verified) on January 30, 2012 - 12:38am. I hope you can sleep at night after writing what your wrote Sarah, this scathing and just downright ABSURD criticism of SU Opera Theater's production has got to be one of the most despicabIe things I have ever read. First of all, lets see your credentials as to why you can judge whether or not an operatic performance is "mature", do you realize these are STUDENTS! UNDERGRADUATE Students, some of whom have no experience with opera, these are not professional singers and players who do it daily, they are students JUST LIKE YOU. Second of all, if realized how hard these students worked to put on this production, maybe you would hold back on such nasty criticism, these students worked their butts off to put this production on the stage, they gave up the last weekend of their winter break for rehearsals not to mention would rehearse in the last few weeks all night long, not getting out of rehearsal til around midnight multiple nights a week, they put their ALL into this production and were very proud of the work they did. Put yourself in their shoes for a second, imagine if you worked very hard to get ready for a big performance and were proud of it but then had to come out and see a nasty review written by someone else? How would you feel? The fact that you have the gall to come on a public forum on your high horse with your "implied knowledge" of opera and the performance of opera and then proceed to rip apart yout fellow students efforts is appalling, I don't know what you were expecting, but I can guarantee you I saw the same production as you did, and I thought those students did a fantastic job, both cast and orchestra! They do not deserve to have all their hard work belittled by some self serving know it all like you who thinks that they know what a "mature" opera performance is. Shame on you for writing this! To the cast and orchestra of the Gondoliers: Don't let this horrible piece of journalism get you down! You guys did a great job and deserve all the great applause you got on all three nights! Submitted by Shelby Bird (not verified) on January 30, 2012 - 12:08am. This article is absurd.... and most importantly, it's untrue! You should be ASHAMED ! Submitted by S Proctor (not verified) on January 29, 2012 - 10:30pm. Thank you for the review. Unfortunately, I feel you were exceptionally harsh on this performance. Your first mistake was sitting so close to the stage. To get a more full, balanced effect, you should have sat further back. Being a student, you have no right to talk like that about your fellow students this way. The entire purpose of this production was a learning experience. Of course, these students have a way to go before they hit their vocal peaks, but the only way for them to peak is to do productions as such. There is a difference between writing a critique and slamming people, and you did the latter. Being a music educator in the area, these students did quite a wonderful job for being an opera workshop class. The directors of this performance have professional careers in music, so it is insulting to my fellow colleagues for you to insult the performance in this manner. You clearly have no musical background and should keep this in consideration before writing your next "critique." Submitted by Kevin Moufadus (not verified) on January 29, 2012 - 8:18pm. It's fortunate that the News House gives you a forum to practice being a music critic. Putting on full operatic productions is one way that we at the Setnor School of Music practice being musicians. The Setnor School of Music is much smaller than Newhouse. We have about 250 students in the entire school. A large number of these students were involved in this production of The Gondoliers. I can say with some certaintly that everyone in all of Setnor knows at least one person involved in this production. Therefore, this article you wrote has alienated an entire school at Syracuse. This is not your job as a student of Syracuse University. It's true everyone is entitled to their own opinion, but while my peers and friends displayed finesse and confidence by practicing for months to perform a three-hour opera, all you displayed in this short article is a lack of tact. Are You Kidding Me? Have You No Shame? Submitted by Anonymous (not verified) on January 29, 2012 - 8:00pm. Submitted by Colleen (not verified) on January 29, 2012 - 7:40pm. This was a college-level opera from a school that doesn't have the money available to them that Newhouse and other various programs on campus have. If you wanted to see professional opera, you should have gone to the Met. This is an outrage of an article and puts down every single person involved in the production, who have all put hours, days and weeks of their time and effort to create this show. Did the writer of this story follow the music with a score, perhaps, to verify that the orchestra members were constantly "coming in early" and "off-tempo" or any other negative commend she made? I don't see professional level work from any part of campus for the simple reason that we aren't professionals, we are students. You should realize that student musicians will never perform at the same caliber of professional performers, hence the reason they are still in school and not playing with the Berlin Philharmonic or singing at Carnegie Hall. Submitted by Dylan (not verified) on January 29, 2012 - 6:47pm. Where does this contributor get off? This is a student opera and mistakes are made. This is after all, a class. The show is just a by product. If you think the orchestra was too loud, the third row was definitely not the place to sit.the balcony is the best place to take in everything for the stage. The vocalists would then well into the texture. Some valid points were made but there was a failure to notice that it was a student opera by Gilbert and Sullivan, who were known for their rediculously ludicrous operas. Submitted by Joe Green (not verified) on January 29, 2012 - 6:15pm. You are placing Gilbert and Sullivan on the same pedastool as a Wagnerian Opera. I'm sorry this production lacked the Brunnhilde you were looking for. Submitted by Brian Erwin (not verified) on January 29, 2012 - 6:08pm. 1) If you aren't charged at the doorm then you should know and expect that it is a low budget show and you shouldn't expect amazing backdrops or props etc. 2) I found it funny how you said that the person who was a professional opera singer in germany for 15 years does not have an operatic voice. You have to understand that a gilbert and sullivan opera sounds different than another opera from 100 years before, so you have to change how you sing.